Not to be confused with Noko Bombette. Bombette is Mario's third party member in Paper Mario. She is a pink Bob-omb (most likely a Bob-omb Buddy) with a ponytail shaped fuse and a white turn knob with no holes that inhabited Koopa Bros. Fortress in the events of Paper Mario. She is also very headstrong, and threatens to explode next to Mario in the Crystal Palace if he hit her instead of the Duplighosts pretending to be her. The role of a party member with the ability to explode has been retained in future installments of the series with the exception of Paper Mario: Sticker Star and Paper Mario: Color Splash (although the Bomb Sticker in Paper Mario: Sticker Star allows Mario to use a bomb attack in battle). The role is taken by Admiral Bobbery in Paper Mario: The Thousand-Year Door, and by Boomer in Super Paper Mario. 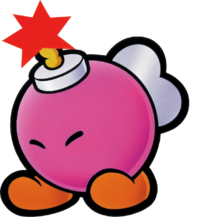 Bombette's name is a pun on "Bob-omb" and "-ette," a suffix for female. A portrait of Bombette exploding. Bombette ready to blow up a wall. When Mario goes to the Koopa Bros. Fortress, Yellow Ninjakoopa traps Mario in a cell. Here, Mario meets Bombette, who was imprisoned in the fortress for exploding next to the Koopa Bros. Bombette helps Mario by exploding to make an escape route out of the cell. She then joins Mario's party. In her field ability, she lights her fuse and explodes, allowing Mario to destroy walls, flip switches, and attack enemies. After she helps Mario defeat the Koopa Bros., she decides to join Mario's party permanently and aid him on the quest to find the Star Spirits. It is also shown in the game that Bombette has recently broken up with Bruce. He is constantly beckoning out for her to get back together with him, but she always refuses comically. In battle, Bombette could Body Slam foes or explode next to them by using her Bomb attack. After upgrading, she can learn more powerful moves like Power Bomb, which hits all enemies on the ground, or Mega Bomb, which hits every enemy in battle. When Bombette blows up the crack on the wall in Crystal Palace, four Bombette imposters show up, whose quotes always end with stars, hearts, extra exclamation points or question marks, and extra periods. Mario must hammer those four Bombettes; after that, the real Bombette tells Mario that if he'd hit her with his Hammer, she was going to bomb him the next time he napped, but she was happy that he didn't. Bombette receives three letters at the Post Office in Toad Town throughout the game: one invitation letter from the Dry Dry Railroad Transportation Department, and two love letters from Bruce. "She's named Bombette. That pink is adorable! She does seem to be pretty strong willed. Her future boyfriend might be in for some trouble!" Hot-headed Bombette was once jailed in Koopa Bros. Fortress. Her specialty is blasting open cracked walls and rocks. Press . She'll walk off and explode, creating openings. Press while she's walking to make her blow up on the spot. In Super Paper Mario, Bombette appears as a Catch Card found on the 40th floor of the Flopside Pit of 100 Trials. She and all the other partners from the Paper Mario series could also be seen very briefly at the beginning of the game, in a photograph at the Mario Bros.' House. Bombette was featured in a 2015 press release made by Nintendo for Women's History Month, which highlighted some of the company's female characters. Card Description: Bombette was Paper Mario's bombastic starlet. Who knew a pink Bob-omb could pack such a punch? Bombette and all of the other partners were scheduled to make an appearance in Paper Mario: The Thousand-Year Door, but she and all the others (except for Lady Bow and Parakarry) were removed for unknown reasons. A sprite for Bombette as well as all the other helper characters from the first Paper Mario have been found in the game's files. There is a pink Bob-omb based off of Bombette that can be found in the Rogueport Sewers. Bombette also has unused data in Super Paper Mario. Bombette is only one of two partners from the original Paper Mario to be able to perform a First Strike, the other being Kooper. ↑ Gulik, Marcin (March 18, 2015). Nintendo Celebrates Women’s History Month With a Look Back at its Female Characters. Gamnesia. Retrieved November 17, 2015.